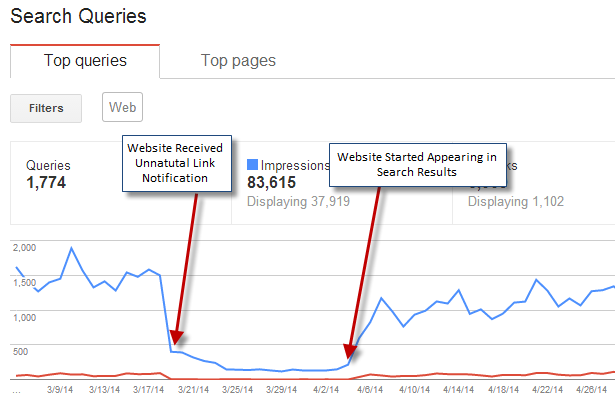 This is a case study about how we helped a client recover his website from one of the most distressing instances in the SEO world – An unnatural Link Penalty, in less than 3 weeks. In this blog we have outlined what the problem was, how we fixed it in just 5 steps, and how we successfully filed for Google reconsideration request. We hope you will find it helpful! This case started in March, 2014. When the client received a penalty mail from Google. When the client approached us, site rankings were lost and traffic was going down at a very rapid pace. 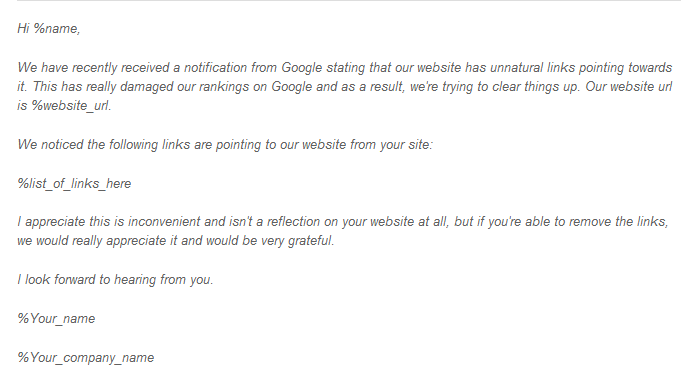 We were happy with the opportunity to help him out and recover his website from Google’s unnatural link penalty. We’re going to explain exactly how we did this. – Enjoy and learn! It’s not easy to plan anything until we have clear picture of what went wrong and where ? What type of links could be the possible cause for penalty? Why we used these tools in particular? We personally believed in job accuracy and collected as much data as possible using all available tools. For best results, we added both the www. and the non-www. forms of the domain to Webmaster tool and collected links from both sources. Once we gathered complete data, we compiled it in a Google Spreadsheet, so we could track the work and could see exactly where we stand in the link removal process. This step is really crucial as this helps a lot while sending a reconsideration request to Google and they can judge with ease that what the webmaster has done to sort the issues with your website. The only problem we faced and probably you will also encounter is the lot of repeated links. 403, 404, 522, 524, Account suspended, the domain name expired, fatal error, server error, server down, serve issue etc. As expected, there were many spammy and low quality links that needed a cure. We manually reviewed each and every link and analyzed against quality guidelines to qualify links that need to be removed or kept as a good quality link. Wondering, how to spot spammy links? Some links were easy to recognize, as they were hosted on well reputed, authority websites. On the same side, it was easy to spot some spammy links as well that were listed on a website along with a multitude of links on the same web page. The simplest way to identify a low quality link is to guess from the page context if the link has been placed purely for Link Buidling motive on the website. If yes, then it is most likely unnatural. Site shows advertisement with do follow links etc. We outreached the webmaster of the respective domains to remove the link permanently. We kept the request mail short, simple, polite without spamming the webmaster with multiple emails at once. Some replied in a co-operative manner but some of them were asking for money to remove links and some of them were not responding to our E-mails. We have asked them that if they will not remove our links we will submit their website to Google disavow and which could be negative for their own website. What exactly we told them is a secret sauce! Webmaster can have a bunch of domains and where they are running a web directory, forum, spammy blog etc. just for the sake of earning money through link placement, advertisement or other means and hence, there is no motivation for them to take a look on e-mails until unless it’s a money making scheme.We have outreached them via phone and it’s gives better results as compared to e-mails. The next step was to take a screenshot of e-mails and replies sent and paste them on the spreadsheet as a proof of your hard work for Reconsideration request. Tip: You can use Jing or other screen capture tools for screenshot. Remember– Google doesn’t want you to remove all of the bad links as sometimes it’s not in your hands too and that’s why they have provided Disavow tool. From the Spread sheet, Google (Reconsideration request reviewer) wants to see that you have made a true attempt to get rid of as many of the unnatural links as possible. Remember – Google will not consider that you are a big brand or a small business who is participating in link scheme, blog network etc. to gain artificial authority. They treat them equally so it’s your job as an SEO to maintain link profile and implement strategies that will earn natural links day and night instead of building links. After doing the above process, we used the disavow tool to get rid of the remaining offensive links for which we haven’t received any response even after 3rd attempt. By this time, we had all our data sorted on the spreadsheet and knew which were the actual links we were unable to remove. Google has very good and comprehensive guide written on How to use a Disavow Tool. It helped us a lot! To be systematic and detailed, we chose to disavow whole domain instead of individual URLs, so that if any links that we are not able to capture using tools, can be removed from Google Index. Note– Do not try to smart play and use the Disavow tool as means to skip the above tasks, as that will not work and will not produce any results. Provide a complete brief from beginning on why your website is penalised and what steps you have taken to comply with Google Guidelines. Explain that you understand your fault and explain what changes you have adopted to avoid this happen again. Be honest and do not try to push the blame elsewhere. 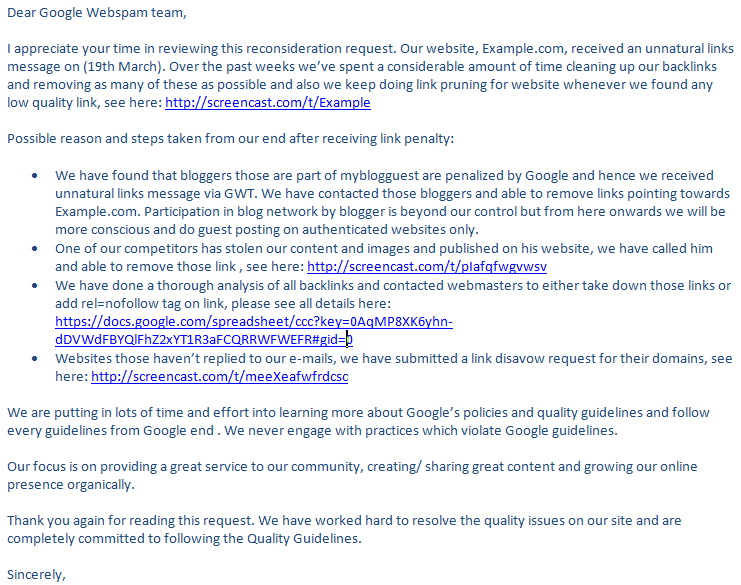 It is advisable to notify the webmaster three times through e-mails prior to using disavow tool. It may be worth it to provide examples in the form of screenshots of the conversation in case the webmaster refuses to remove the link. The Google Spreadsheet that you prepared with all links removed or marked to be disavowed should be shared in your reconsideration request to Google. Only submit a reconsideration request if you are completely satisfied that all appropriate actions have been taken to fix the issues associated with the website. The penalty from the client website is removed successfully and the site will start appearing back in search results. Good luck and if you have any questions or other considerations regarding your website, please get in touch with us.